Like a lot of games, N++ has a profile screen in its option menu. It details a number of the player’s statistics—time played, amount of deaths, etc. Instead of a typical completion percentage, though, it displays an absurd number. Despite the fact that I haven’t yet finished all of the game’s more than 2,000 stages, my number is somewhere around 3,000 percent. It’s a cute joke, but it points to a fundamental reality of Metanet Software’s newest: This is as much a game as it is a conduit. With stage-creation tools and extensive cooperative multiplayer—did I mention it has more than 2,000 core stages?—N++ is a seemingly infinite roadmap designed to deliver as many running and jumping crucibles as players can handle. It’s a refined creation, but it’s also more than a little intimidating. In N++, the supposed final game in the N series of ultra-hard platformers, you play as a tiny wireframe ninja. Due to whatever cosmic punishment that wireframe ninjas incur, you spend your days racing against the clock in a series of challenge rooms, each with a switch and a door. Hit the switch, get through the door, go to the next stage. You’ve got a full repertoire of ninja abilities: run, jump, slide, slide jump, jump slide, and that classic Ninja Gaiden-style wall jump. And you’ll need them. Each stage is a crucible, a tightly crafted challenge whose small size belies the regularly intense challenge. You can easily spend 30, 40, or 100 attempts on a single stage, trying to collect all the time-extending gold without getting killed by the various mines, robots, and shadow ninjas out for your head. All of this brutality is presented in a slick, modernist style full of clean lines and solid colors. From a distance, each stage looks like a piece of abstract graphic design, as if someone had taken the work from one of the master designers in the Helvetica documentary and filled it with death traps. It lends a layer of aesthetic sheen to the stripped-down immediacy of its platforming challenges. Along with responsive controls and smart level design—both of which have been refined through the series’ evolution from Flash game to featured PlayStation 4 release—N++ feels fundamentally good to play. The sheer scale of it all is a bit overwhelming, though. With promised future downloadable expansions and the aforementioned staggering number of stages—growing by the day thanks to a community of talented players making custom courses and sharing them online—N++ appears infinite. Every stage that’s completed after a long struggle is met with satisfaction and an enthusiastic invitation to keep plowing ahead. “There’s so much more for you to try!” N++ says. “But we made this for you!” N++ shouts back. The scope and purity of N++ is praiseworthy, but extended play sessions are an exhausting blur. As inventive as they are, the little stages run together, especially because there are so many of them. The repetition starts to show weaknesses in the design, too. The gold you have to collect is sometimes just scattered in big clouds, forcing repeated clumsy jumps that go against the speed and efficiency the rest of the game encourages. And certain design conceits, such as having to spring a trap on yourself to get at those last bits of gold, are woefully overused. 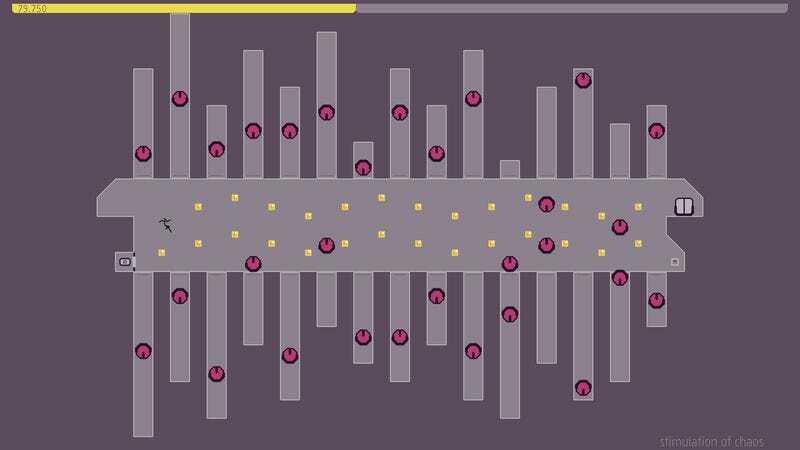 Maybe N++ needs to be consumed in short jaunts—pop in for a quick platforming fix and hop out when your eyes start to bleed. The core of it, after all, is trimmed to near perfection. Its sprawl, though, invites long play sessions and the short individual stages fuel a dangerous “just one more, just one more” fervor. A quick jaunt can easily turn into twitchy marathon, and before you know it, you’re anxious and grimy and feeling like you woke up somewhere disconcerting after a long bender. Looking at the progress page after a session, that silly 3,000 percent completion number feels less like a friendly joke and more like a snarky challenge: “How much can you handle?” N++ seems to be asking. It might not be a challenge you want to meet.